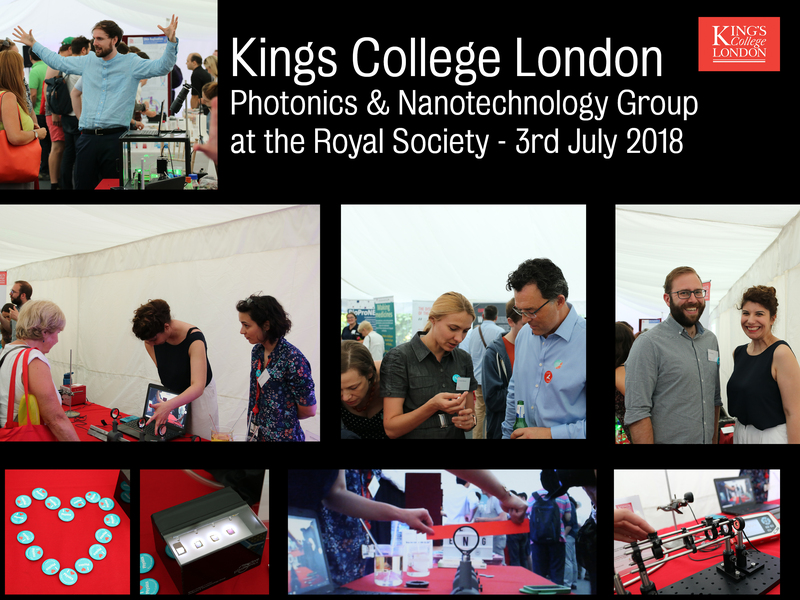 On the 3rd July, researchers form the Photonics & Nanotechnology group at King’s College London made the short trip down the Strand to showcase their high quality research to members of the public at the Summer Science Exhibition Lates at the Royal Society. The demonstrations revolved around the control of light for applications in imaging metrology, sensing, quantum technologies and advanced materials for nanophotonics. Royal Society Research Fellow Dr Sasha Rakovich’s demonstration was aimed at highlighting the significance of spatial control of light for sensing applications and why nanomaterials, such as nanorods, cab form the basis of next generation sensing devices. Dr Diane Roth and Luke Nicholls demonstrated an all-optical sensing system based upon a nanostructured array of metallic nanorod. These nanorods are extremely sensitive to changes in their environment and therefore make a great optical sensor. In their demo, they used this sensing capability to detect hydrogen.